Hi, neglected Mad Writers! I haven’t blogged about my writing adventures for…um…a bunch of time. So we’re going to play catch-up real fast, then get into Week Six! I accomplished very little in week three, so there’s not much to report. Sadface. 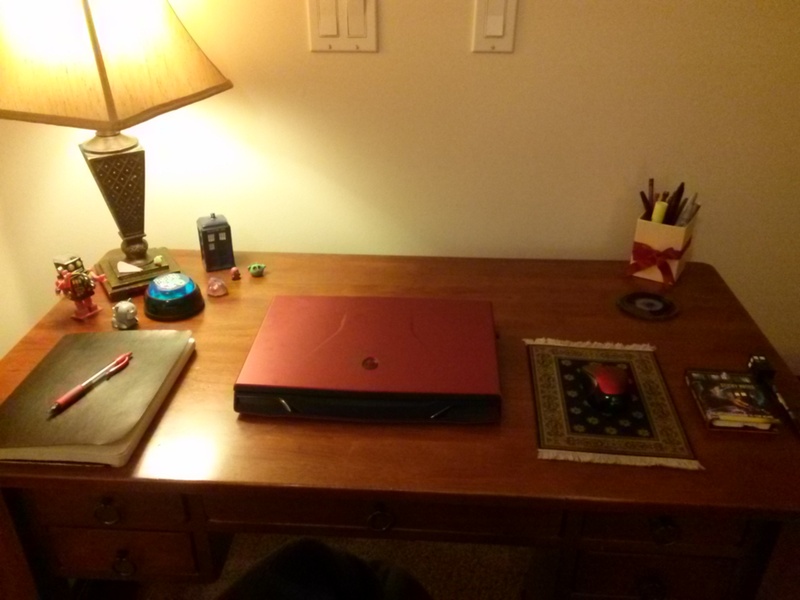 Scarlett, my hand-written manuscript, and my toys. 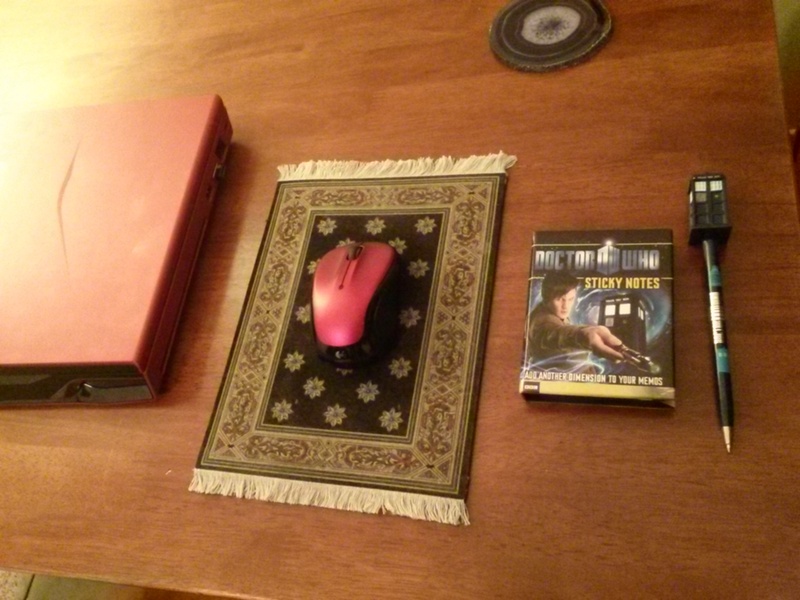 The Doctor helps me keep track of things. Desk Toys! 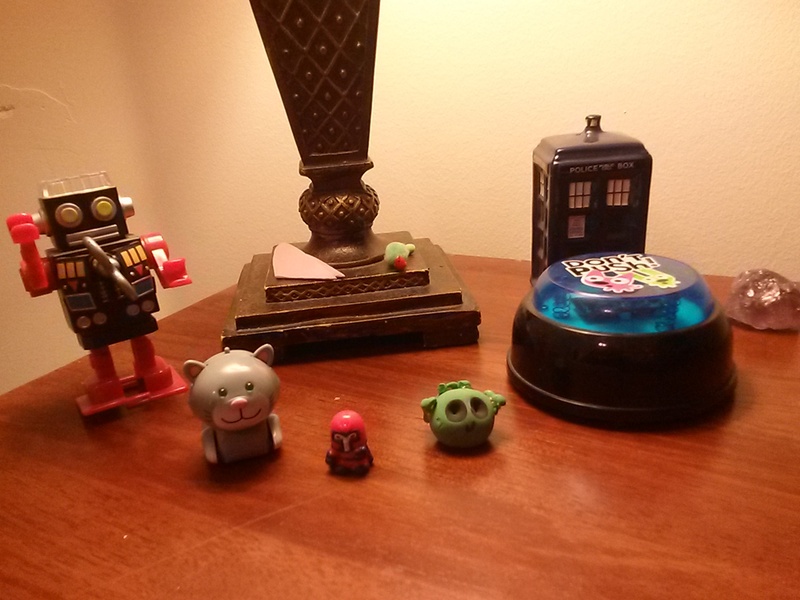 From the left, we have my Robot Pencil Sharpener named Rob (for “robot” because I am so creative), Creepy Kitty (so named because, if you activate Creepy Kitty via the button on his head, he will make a REALLY WEIRD noise and flail his little arms and scoot around the desk. And then he’ll stop. And then two hours later, he’ll start doing it again. And then, in the middle of the night, HE’LL DO IT SOME MORE. And it is creepy), Squishy Magneto, Alien-Head Harry, my “Don’t Push” button, and a TARDIS salt shaker which I keep on my desk because REASONS. Also there is an amethyst because why not. And on the lamp is a caterpillar that my sister made me. Also some heart-shaped notes. I accomplished things! Actual, quantifiable things! In week four, I finally wrote that synopsis that had been hanging over my head. It’s funny, because I had been dreading it, but once I got into it, I loved it. It helped me sort out plot issues, it helped me get really clear about some things I was still pretty vague on, and best of all, it got me all pumped up about this story again. I fell in love with it once more and am now all psyched to get it finished! And to answer the week’s question: I would like to say, “I write because I love it,” but it’s not that simple. I mean, I do love to write. But I also have to write. I’ve tried not writing–being busy with school or work or whatever else there is in life–and it doesn’t work. It doesn’t happen. If I don’t write, the words will come anyway. they will spill out of me. They will find their ways onto Evernote ramblings posted from my phone, sticky notes on my desk, scrawlings in the margins of my planner, and scribbled-on napkins that I stash in my pockets. The words will narrate endlessly in my head until I write them down somewhere, be it a word document or a receipt in my purse or the back of an old calendar page. I write because there are worlds upon worlds and countless people trapped within me, and I’m not big enough to house this crowd. This week, I hit the 50% mark on my manuscript’s second draft! Half-way done! Woohoo! To answer this week’s question, I’d like to introduce you to two of my six main characters (SIX IS NOT TOO MANY MAIN CHARACTERS AND I DON’T CARE WHAT YOU SAY): Judith and Lilith Mikhalis. Judith and Lilith are sixteen-year-old totally-not-identical twin sisters living under the very oppressive rule of their government, which persecutes people like them–people with powers. They spend this book primarily on the run–their involvement with the underground rebel movement has been discovered and they are basically just trying to get the hell out of Dodge. Both possess telekinetic and limited telepathic abilities, along with a couple unique powers of their own. Judith can heal, Lilith can project force fields, and because their parents were both ex-military, the girls are trained in self-defense and some basic espionage. They know a lot more about staying alive than your average teenagers…which is lucky, because there are a lot of opportunities for them to get dead. I was going to draw you a picture of them, but life ate my homework, so you’ll just have to wait. Hey! That’s this week! Yay! I have continued working on the book, making some epic fixes that will drastically improve my book, so that’s awesome. I don’t know my exact word count for this week but it’s decent without being shameful or impressive. I’m at that point in the novel where I love my story, and I adore my characters, and it’s coming together nicely…but it’s just not…there yet. It’s good, but it’s not good enough. It has the potential to be amazing, but it still isn’t quite at the level I want it to be. I suppose, considering that it’s only draft two, that shouldn’t be too troubling, but still, it’s something you just want to click into place and you can’t wait till it happens. Also, part of my problem is that there are some huge elements that I really, really want to bring into the book that I simply haven’t had the chance to explore yet. For instance, there is some serious discrimination that’s going to take place, and in fact already should be taking place, that I haven’t even touched on yet. I see places where I can include it in the revisions, but for now, my focus is getting this draft completed. As for when a project distracts me…projects are always distracting me. I have an Evernote notebook called “WRITING” wherein I drop all my ideas. I’ll write up whatever I have on it–a character sketch, a rough outline, anything. I catch myself fiddling with my new characters time and time again. Right now, the lovely Scarlett De Raisx is nagging at me to write her story. I keep having to add notes to my Evernote folder because I keep coming up with cool stuff I can use on her. Also have another story idea which I don’t want to say anything about at the moment because I’m not sure what direction to take it and, depending on how I approach it, it could be spoilery! BUT IT INVOLVES ROBOTS, I CAN TELL YOU THAT MUCH. 1. I love your desk and your toys. I am now concocting a plan to steal all the toys from your desk.